Trust me- these things are delicious! I was so skeptical at first, even though I like pickles with my tuna! You want to start by combining the tuna, mayo/salad dressing, Dijon/yellow mustard, lemon juice, dill, and celery in a large mixing bowl. Be sure and mix until the ingredients are all combined. Add the salt, pepper, onion powder, and garlic powder and combine/mix some more. Next you want to slice the pickles in half;lengthwise. Take a spoon and scoop out the seeds of the pickles to create “boats”. Fill the hallowed pickles with the tuna mixture. You can garnish with paprika and/or more dill and enjoy. These have been a huge hit at my house for several years. I am not sure why I never thought to make them for our July 4th celebration, but I am going to surprise everyone with them this year for sure! I am always the one struggling with what to bring to the July 4th cookout. So I decided this year I am bringing some not-so-traditional items. I also decided it wouldn’t spend all day cooking so I made sure my items were easy, tasty, and didn’t take up a whole day. Start by preheating your oven to 400°. Place the jalapeños, cherry tomatoes, and onion on a large baking sheet and drizzle the oil on top. Season with ½ teaspoon of salt and pepper (we added ½ teaspoon of garlic and onion powder as well). Roast until slightly charred. This takes around 20 minutes. 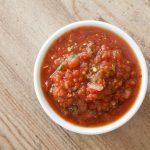 In a food processor or a blender, place the roasted vegetables, the cup of quartered tomatoes, lime juice, garlic, cumin, and the pinch of red pepper flakes. Add the remaining 1 1/4 teaspoons salt and pepper (we also added garlic and onion powders). Pulse a few times until mostly blended. We wanted ours mostly chunky but if you prefer less chunks pulse longer. **If you are using a blender you will need to stir the bottom after every few pulses. Pour into a bowl and it is ready to serve! That’s right. I decided salsa would be one of my items. 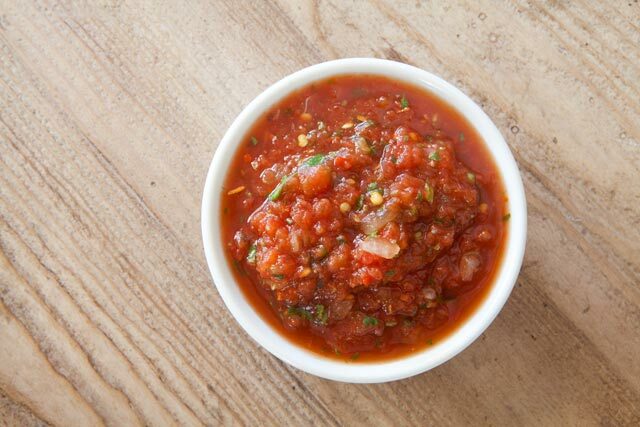 I mean, really, who doesn’t love homemade salsa? !